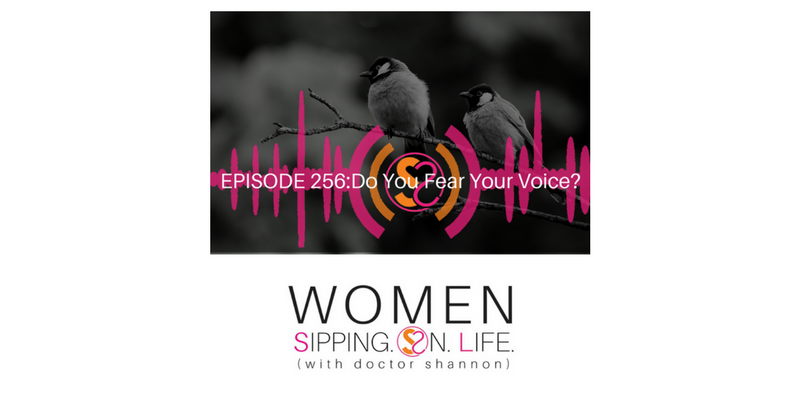 EPISODE 256: Do You Fear Your Voice? Until you go into your darkness, you won’t be able to fully experience the YOU that’s desperately and divinely looking for YOU. She desires to be heard. Yes, the birds were back again early this morning. Oh my goodness, and this time it started at 2:09! Then it stopped and this precious little bird brought a buddy back with him about an hour later. They sang together. 1. Are you willing to bring LIGHT into the darkness? Yes, you must fear it to find it. Fear is reverence. Honor and respect it (YOU) as sacred. 2. Are you willing to SING IN THE DARK? Find your voice in the dark places. 3. Are you willing to WAKE SOME PEOPLE UP while you sing? Speak up. Regardless whether it’s on someone else’s timeline or not. They will either sing with you or they won’t. 4. Are you willing to feel uncomfortable and keep singing? Once you begin to wake some people up, they’re going to notice and see you. Will you keep singing, even when it may feel “unfamiliar”? 5. Are you willing to share your story — what would you like to share? Answer these 5 questions, and begin to journal out the answers on the inside of you. Begin to express your voice on paper. Begin to let it out. Take what’s deep within you — in those dark, deep places — and begin to express it, and get it out into the light so you can see it in front of you. Then begin to share it. Briefly share your story, and I’ll be selecting listeners to share their inspiring stories of truth here on the podcast. What do you think? Are YOU ready to share your story? Birds sing, and they also FLY. Are you willing to FLY?